Open a generated .html file in a browser. 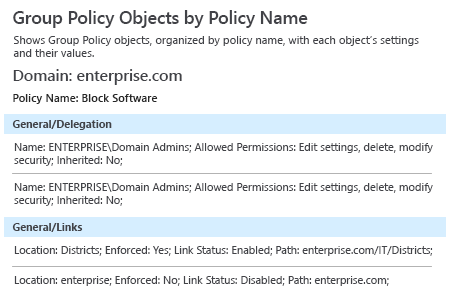 Run Netwrix Auditor → Navigate to "Reports" → Expand the "Active Directory" section → Go to "Group Policy - State-in-Time" → Select "Group Policy Objects by Policy Name" → Click "View". 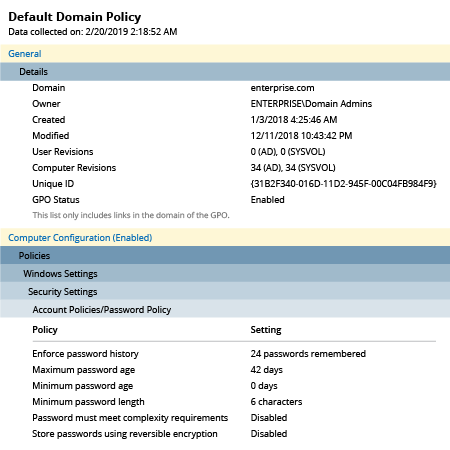 IT administrators are frequently asked by either their managers or auditors to produce a report that proves all Group Policy settings are correct. To satisfy these requests, IT pros need to quickly export Group Policy settings into an insightful report in an easy-to-read format. They can create acceptable passable reports by running scripts, but this method of Group Policy export requires a great deal of time and effort that could be better spent on more important tasks. 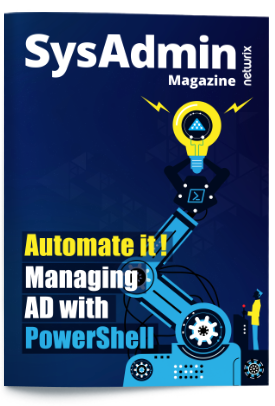 Netwrix Auditor for Active Directory slashes report preparation time by delivering actionable data about changes and access events across your Active Directory environment, as well as state-in-time reports about Active Directory and Group Policy configurations. You can easily compare the current configuration to any point in the past or export Group Policy information to satisfy requests from auditors or management. In fact, you can export Group Policy settings into a variety of formats, including PDF, Excel or Word, and deliver the reports in just minutes, giving you more time to focus on your other responsibilities.